First of all, remember that you can find a lot of great advice here regarding business etiquette and more. Here’s 1 more tip to help you out when you need to impress someone but don’t want to come about as being too much – if you have special dietary needs, visit the restaurant’s website in advance to peruse their menu and see what you can and cannot eat. If you have questions (perhaps you require a Vegan or a Gluten Free meal, or want to know if their kitchen is Kosher) then contact them in advance. AVOID asking the server a lot of questions. Also, AVOID ordering a very complicated meal. Why? Although your friends might just think that your order makes you a “pain in the rear” your business colleagues will consider this to be annoying and think of you as High Maintenance. This reflects upon you negatively. 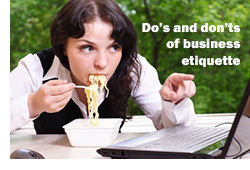 Business etiquette is something that people tend to overlook; even experienced people. Oftentimes we forget that it isn’t experience that seals the deal: it is the way you are perceived from an “at a glance” point of view. Everything from the dining to the way the dining table is set up tell its own particular story regarding how much importance you have given a particular event. And we always want people to feel important. Here’s a link to the article published on HubSpot Blogs.